The Mini Blower is a compact confetti machine. 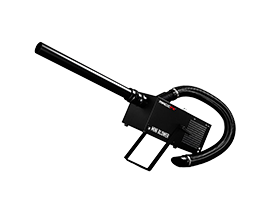 With its specially designed inside flexible hose and special wand attachments, it can vacuum and shoot out confetti continuously, to approximately 5-7m. Perfect for events where you want a sustained confetti effect, but don't want a high consumables cost, these electric mini-blowers are a great alternative to more traditional confetti cannons or blasters.